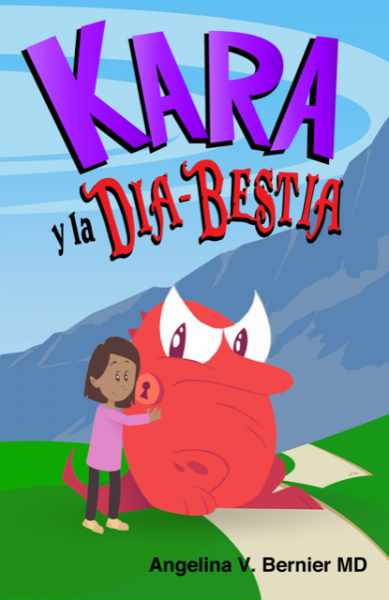 Kara and the (Not So) Dire Beastie is the story of a 10-year-old girl diagnosed with type 1 diabetes who goes on an adventure that helps her learn what it means to live with diabetes and what’s involved in daily D-management. By navigating her way through a fairy tale land and befriending a creature named the Dire Beastie (which to her, is what “diabetes” sounds like) she experiences scary highs and lows while finding treasure and traveling to new worlds. Developed by Angelina Bernier, MD, University of Florida Pediatric Endocrinologist, and in collaboration with Florida-based non-profit animation studio Drawn from Valor, this series of comic/cartoon shorts debuted in mid-July at the Friends For Life annual conference in Orlando. In honor of Diabetes Awareness Month, we are happy to be releasing the Spanish version of this animated education series. En honor del mes de conciencia de la diabetes, estamos muy emocionados en anunciar la publicación de Kara y la Dia-Bestia en español. This animated series can also be found on Youtube.